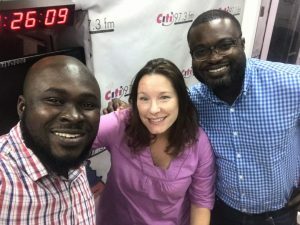 On October 10, Bloom Impact Co-founders Carol Caruso (CEO) and David Hutchful (CTO) were featured on CitiFM (97.3FM), as part of a segment titled #CitiTrends. The CitiTrends is a radio show focused on technology and is hosted by Kofi Ashon, Operations Manager at CitiFM and avid tech blogger (Twitter: @KofiAshon). unaware of the variety of options on the market and how to choose what is best for them and their business needs. Additionally it is difficult to know what is needed to be eligible and gather the required information. Bloom Impact aims to address these problems by educating MSMEs about financial services, how to be eligible and options on the market and applying innovative technology to match customers with products that best meet their needs - saving time and money for them and financial service providers. CitiFM is one of the premier radio news stations in Ghana, reaching millions of Ghanians every day. The station covers a variety of sectors, from politics to business to sports. CitiFM has received numerous awards for their work, being named New Radio Station of the Year in 2007 by the BBC and the Most Innovative Newsroom in Africa at the Telkom Highway Africa Awards 2012. It is based Accra, Ghana, and operates on 97.3FM and www.citifmonline.com.